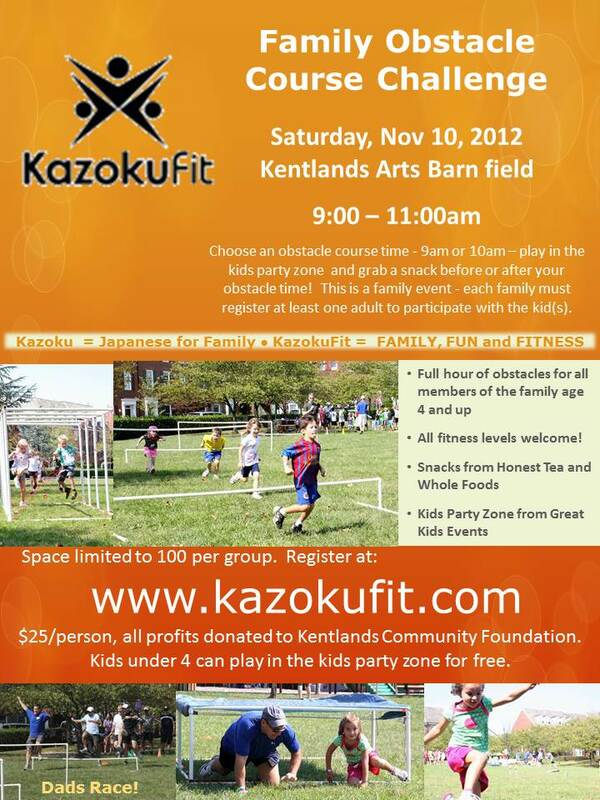 This family fitness event on Saturday November 10 at The Kentlands looks incredible! Hosted by KazokuFit, the focal point of the fun is an entertaining obstacle course challenge for kids and their parents. All participants 12 and under receive a T-shirt and temporary tattoo upon completion of the challenge. There will also be loads of kids’ fair fun brought to us by Andy’s Parties: inflatable slides and moon bounces, face painters, additional fitness challenges. Other sponsors are providing healthy snacks and beverages. The price is $25 per person, but with the special online registration code KazokuFit10 you will get $10 off per ticket. And the proceeds go to a good cause: The Kentland’s Community Foundation. This looks like a unique way to achieve fitness-filled family time! Contact kazokufit@gmail.com for more information.